Go here to open the Visual Studio 2015 version of this topic. After a Team Foundation Server (TFS) upgrade, you’ll want to use the new features that were installed. Some of these features might require updates to your team project. The Configure Features wizard is the easiest way to make this happen. If you need to upgrade TFS, go to the downloads page. Do you have a lot of team projects that need to be updated? If so, you can apply updates programmatically. If you're not a team project administrator, get added as one. Only project administrators or TFS administrators can run the wizard. Open the administration page for your team project from a supported browser (http://ServerName:8080/tfs/CollectionName/ProjectName/_admin). If you see a Configure Features link, run the wizard. The options in the list depend on the TFS versions that have been installed on your application-tier server and the features that have been previously configured. To get the latest process templates, upgrade your server to the latest version. If Test Plan and Test Suite are not configured, go to Manual updates to support test management. You will need to manually import the WIT definitions and migrate data after you have upgraded your application-tier server to TFS 2013.3. If you don't see the Configure Features link, your features have been enabled. You can start using the new features. If you receive a message similar to the one shown below, you can configure your team project. If more than one process template is available, accept the recommended version. If the dialog box doesn't contain a Configure option, then you’ll need to apply the updates manually. In most cases, the wizard will configure all the new features and you'll receive a success message. Occasionally, the wizard will partially update your team project and return error messages that require resolution. Make a note of the errors that you receive and perform manual updates to resolve each error. If you have updated a team project based on v5.0 of MSF for Agile, do the manual updates described in Update the Workflow for Agile Team Projects. If you have team members that will use one or more of the following TWA features, you’ll need to provide them Full access to TWA. If your team will use the feedback request and code review features, make sure that you have configured an SMTP server for TFS. When the wizard is unable to update a team project, it will return a message indicating that there are no process templates available to support the update. If your team project is based on a process template other than those that TFS provides, update the customized process template used to create the team project, and then run the Configure Features wizard. TFS process templates correspond to Visual Studio Scrum, MSF for Agile Software Development, and MSF for CMMI Process Development as described here. If your team project has been heavily customized, but not the process template, add the new features manually. If your team project was based on a v4.2 or earlier version of an MSF process template, first apply the updates to comply with TFS 2012 manually. Then run the Configure Features wizard. After you update your team project with the Configure Features wizard, you have access to the latest features and process templates. However, you still might want to make some additional customizations based on the TFS update you’ve installed. You might need to make some additional customizations for teams to choose whether to track bugs on the backlog. If you have Visual Studio 2013.3 Microsoft Test Manager installed in your environment, you’re done with your updates. To learn about the changes introduced with the updated version of Test Manager or Team Web Access, see Plan Manual Tests using Team Web Access. If you want to customize your test plan or test suite, you can now do that. If you add or change the workflow states for the test plan or test suite type definitions, and you work from a Test Manager client provided with Visual Studio 2013.2 or earlier versions, you must also update the process configuration for the team project as well. Otherwise, you’ll encounter an Application detected an unexpected fault error when you connect to your team project. To resolve this error, see Import and export process configuration [witadmin]. 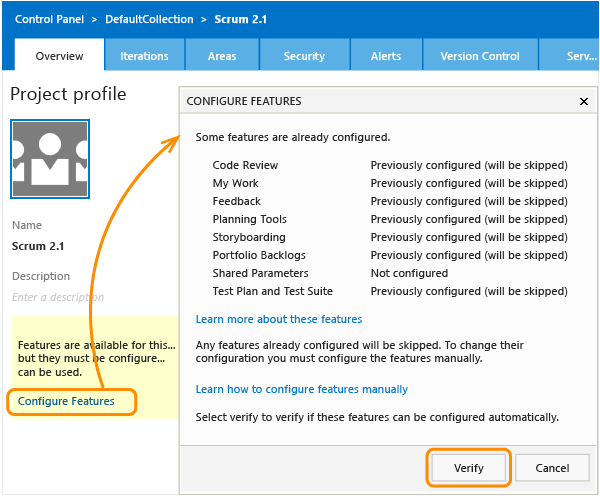 There are no additional required customizations to make after updating from TFS 2012 to TFS 2013. However, there are some recommended updates to make to the workflow of specific WITs. The updates bring your team project up to date with the workflow settings that are defined in the latest versions of the default process templates. Scrum 2.0 to Scrum 2013: Product Backlog Item and Bug. Agile 6.0 to Agile 2013: User Story. CMMI 6.0 to CMMI 2013: Requirement. For details, see Upgrade your 2012 team project from RTM to Update 2. If you haven’t customized your work item types or process configuration, you can update the items quickly by using witadmin. Just download the latest version of the process template that is compatible with the one used to create your team project and then import the updated WITs. If you’ve updated a team project that was created with an MSF v 5.0 Agile process template, then you’ll also want to manually update the user story and task workflow assignments. If you don't update the workflow, then the task board provides only two states, Active and Closed. This prevents you and your team from distinguishing between tasks that are in progress from those that haven't been started. Also, you might want to apply the workflow updates to the User Story as described in Upgrade your 2012 team project from RTM to Update 2. Q: How can I programmatically update many team projects? A: If the team projects were created from the same process template, you should be able to modify the source process template, upload it, and then batch update all team projects defined for a team project collection. Review the following resources: Update a customized process template to access new features, How to Configure Features for dozens of team projects, and Features4tfs CodePlex solution. Q: Where can I learn more about how to customize the test experience? Field customizations: Add a custom field, modify a pick list, or add a field rule. Work item form customizations: Modify the form layout for the bug, test case, test plan, or test suite. Workflow customizations: Modify the workflow definitions for the bug, test case, test plan, or test suite. Test failure types: Specifies the reasons why a test run failed. The default configuration includes: Regression, New Issue, Known Issue, and Unknown. Test resolution states: Specifies the action to take after a test run failure. The default configuration includes: Needs investigation, Test issue, Product issue, and Configuration issue. 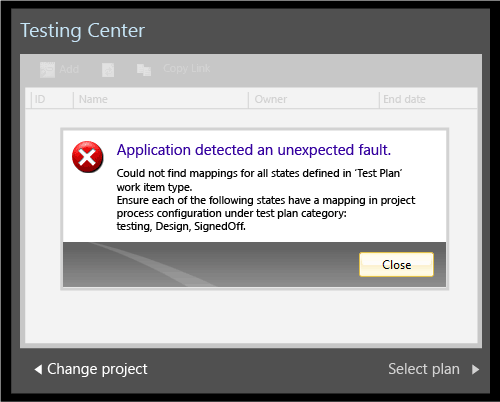 Q: How do I resolve warning or error messages related to the update of test management artifacts with TFS 2013.3? A: See Manual updates to support test plans and test suites. Q: How does the Configure Features wizard work? A: The Configure Features wizard adds new objects to your team project and might update a few existing objects, but does not change your data or the workflow. It adds the new objects based on the best match of settings defined within the installed process templates and your team project. The wizard references both updated customized process templates and the latest version of Microsoft process templates installed to your team project collection and added during the upgrade process. If the wizard determines that there is more than one process template that could be used to configure features, it selects the one that best matches your existing team project and that is the latest version. Scans the definitions in the team project to determine which features are and aren’t configured. Determines which process template stored in the team project collection contains the best match of definitions to configure missing features. For each feature that can be configured, uploads the definitions for new objects or modifies existing definitions. 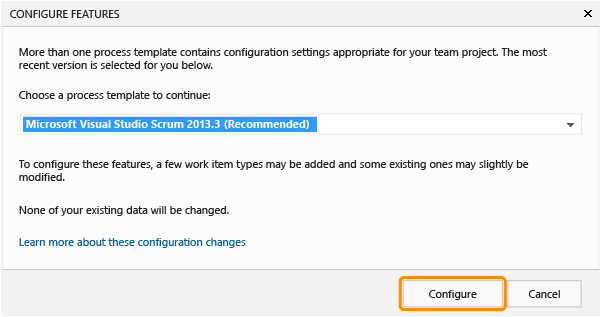 To learn how the wizard configures each specific feature, see Configuration actions made to add each feature. Q: To run successfully, which elements does the Configure Features wizard depend on? A: The Configure Features wizard depends on the following elements. The ProcessTemplate file must include the version statement. If the version statement is not present, the Configure Features wizard cannot select the process template for updating a team project. Also, the highest version number must be unique for each template ID. If more than one process template that specifies the same highest version number for the same template ID has been uploaded to TFS, then none of the process templates can be selected for updating a team project. Assignment to synchronize personal names with Active Directory (syncnamechanges). Reference names assigned to fields and link types must be unique within a team project collection. Friendly names of the categories must be unique within a team project. 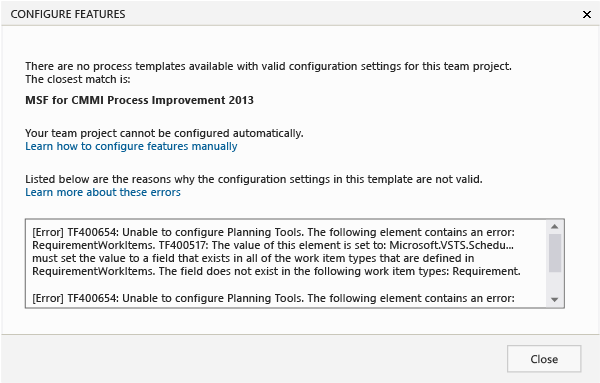 There are no process templates available with valid configuration settings for this team project. Your team project cannot be configured automatically. You will have to rename or reinstate the missing WITs or categories to your team project, and then rerun the wizard. Or, you can modify the process templates to add the features and then rerun the wizard. If any conflicts occur, you will receive an error message. See Resolve Errors Received When Configuring Features. Q: I’ve added portfolio backlogs to my team project. Why can’t all team members view them? A: To view and work with portfolio backlogs requires that each team member has Full access. Q: Where can I go if I have more questions? A: You can post a question or search for answers in one of these forums: Team Foundation Server - Work Item Tracking or Team Web Access.